Illinois Super Lawyers has named 12 Salvi, Schostok & Pritchard P.C. attorneys to its annual list. They include Patrick A. Salvi, Jeffrey J. Kroll, Patrick A. Salvi II, Matthew L. Williams, Jennifer A. Ashley, Aaron D. Boeder, Elizabeth R. Olszewski, Brian L. Salvi, Andrew J. Burkavage, John A. Mennie, Rob L. Kohen, and Eirene N. Salvi. Each year, no more than five percent of Illinois lawyers receive this honor. The list will be included in the 2018 annual Super Lawyers Magazine and in Chicago Magazine’s February 2018 edition. 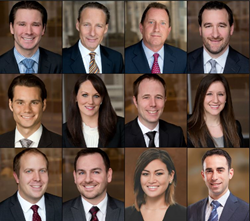 The 12 Salvi, Schostok & Pritchard lawyers named to the list are not only dedicated to their clients, but published authors, accomplished speakers, experienced trial attorneys, members of several professional bar associations and involved in their community. Patrick Salvi and Jeffrey Kroll have been named to the Illinois Super Lawyers list since its inception in 2005. Mr. Salvi was listed in the 2018 Top 10 and Mr. Kroll was listed in the 2018 Top 100. Super Lawyers is a rating service of outstanding lawyers from more than 70 practice areas who have attained a high-degree of peer recognition and professional achievement. The patented multi-phased selection process includes independent research, peer nominations, and peer evaluations. For more information on Salvi, Schostok & Pritchard’s 2018 Illinois Super Lawyers, please contact Marcie Mangan at (312) 372-1227 or mmangan@salvilaw.com.